What is the significance of the lotus in Hinduism? Today is the third day of Navaratri and I continue with the Navavarana compositions of Dikshithar. If you have just landed on my blog, you can find the first of the series here. Today’s kriti is dedicated to the third Avarana (enclosure) which is an eight petalled lotus. Have you noticed how often the lotus appears in Hindu symbolism? We have Brahma, the creator, who emerged from the lotus. We have Vishnu, the protector, from whose navel the lotus emerged. We have Lakshmi who is seated on a red lotus and Saraswati who is seated on a white one. Vishnu Purana describes the earth itself as a lotus. We describe the eyes of Gods and Goddesses as lotus-shaped – rAjIva lOchana. We describe the faces to be lotus like – kamala vadana. We describe their feet to be lotus like – pAda kamala. Wise ones sit in padmAsana or the lotus-position in meditation. The Chakras in our bodies are said to be lotus-like, ending with the Sahasrara, the thousand petalled lotus associated with Supreme Consciousness. The soul is said to be in a lotus inside our hearts. 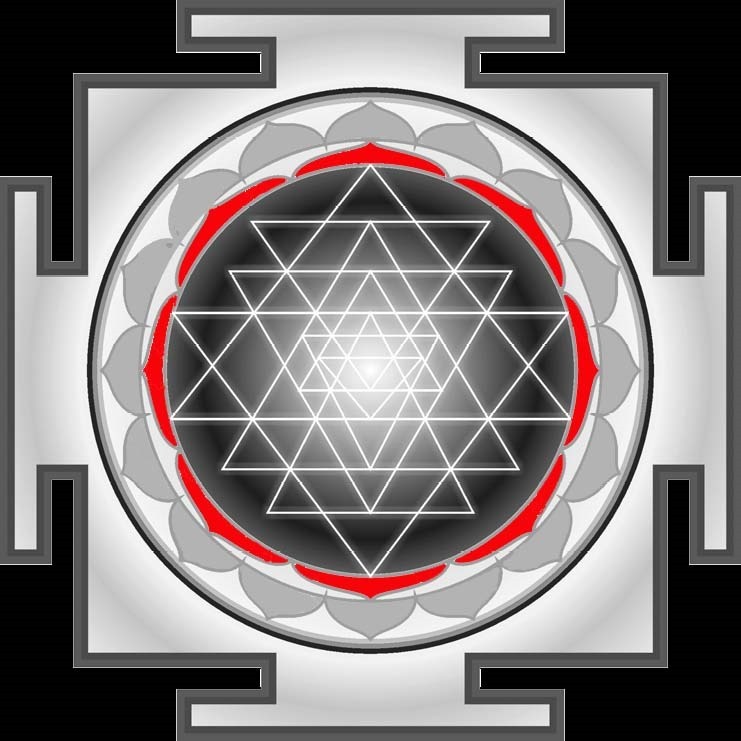 And of course we have the Sri Chakra with two of its Avaranas symbolised as lotuses. What is this obsession with lotus? The lotus is quite a remarkable flower. Interestingly, the plant has the ability to regulate the temperature of it’s flowers (ref. ), somewhat like warm-blooded animals. As a viviparous plant, it generates offsprings attached to the parent, as a child is attached to the womb. It has remarkable longevity – it’s seeds can live up to 1300 years! In fact it’s genes have the ability to repair diseases and can withstand environmental stress (like freezing) (ref.). And it is so very beautiful! No wonder it has become one of most important symbols of Hinduism. One oft used symbolism is the flower’s purity despite it’s origins in mud. Though it’s roots are in mud, it rises far above, untouched by the mud or the water. In the Bhagavat Gita, it is said that “One who performs his duty without attachment, surrendering the results unto the Supreme Lord, is unaffected by sinful action, as the lotus leaf is untouched by water.” (5:10). The way it closes at night and sinks to rise again in the morning, and its regenerative qualities mimic the cycles of life and soul. Its amazing fecundity makes it a symbol of fertility and even immortality. I need to do more research into this; the lotus seems to be interwoven into our texts in so many different ways. So we come to today’s song Sri Kamalambikaya set to raga Shankarabharanam dedicated to the Goddess of the third Avarana called सर्व संक्षोभण चक्र Sarva Sankshobhana Chakra (All Churning Chakra). I wonder at the name – is it because by the time you reach this stage, your world is totally churned up? The presiding Goddess is Tripura Sundari. Let us think of her while listening to Kunnakudi M.Balamuralikrishna presenting this song for us. I (aham) have the grace (kaTAkshita=looked at with the corner of the eye) of Kamalamba. I am (asmi) the Brahman filled with (paripUrNa) the bliss (Ananda) of existence and knowledge. By the one served by (sEvitayA) he who chastised (shAsana) Paka (=Indra) etc (Adi), by the one contemplated upon (bhAvitayA) by he who is on the lotus (pankaja) seat (Asana) and performed (kRit) the original (Adi) five tasks (pancha-kRitya) (=Brahma), by the one whose feet (padayA) are skilled (chahatura) in dispelling sorrow (shOka hara), by the one who bestowed (pradayA) speech (vAk) to the eminent (mukhya) dumb one (mUka) (ref. ), by the one whose feet (padayA) outdoes (vijaya) the lotus (kOkanada), by that embodiment (implied) of those (tat) three (trai) words (padaya) of Guruguha (Kartikeya, also signature of composer). By the cause (kArayA) of the eight (ashTa) powers (shaktyA) starting with Anangakusuma, by the cause (kArayA) of the reddish (aruNa) coloured (varNa) Samkshobhana chakra, by the consort (nAyikA) of the Lord (nAyaka) of the innumerable (ananta) crores (kOti) of worlds(aNDa literally egg), by the embodiment (implied) of the one consisting of (Atmaka) eight (ashTa) secret (gupta) parts (varga) (this chakra is made of eight petals), by the surpassing one (tarayA) (unsure of this), by the best (varayA), by the one worshipped by (upAsitayA) cupid (ananga) etc (Adi), by the one seated on (sthitayA) on the eight (ashTa) petalled (daLa) lotus (abja), by the one who has hands (karayA) holding (dhara) a bow (dhanur) and arrow (bANa), by the one who is an ocean (sAgarayA) of the nectar (sudhA) of compassion (dayA). Yes, the lotus is unique in Indian culture and tradition. Just as probably jasmine is in South India. Choosing to feature up and coming vocalists is a nice touch in this series. Haven’t heard him before. By the way did I miss the raga name in the krithi which is a wonderful trademark of Dikshithar ? Yes, you did miss it – I have noted in the post that it is Shankarabharanam. In fact, I haven’t featured this raga before and need to do a small raga write up that I usually do…will wait for after as these daily posts are too time consuming! It is nice to hear these young ones, no? I have featured Kunnakudi M.Balamuralikrishna once before in this post. Difficult to share one’s name with such an illustrious artist, wouldn’t you think?